A mezuzah declares: The people who dwell here live Jewish lives. A Jewish household is created by the people who live in it–by the way they act, the things they do and don’t do, the beliefs they hold. To a great extent, a Jewish way of life is a portable faith: you can take it with you anywhere you go. This is true for Shabbat, kashrut, Taharat Hamishpachah [family purity laws], daily prayer, and study of Torah. Scroll down for mezuzah instructions, blessings and video how-to’s! You can buy a mezuzah here or at any Judaica store. It is generally accepted that Judaism as a religion is more oriented to holiness of time than holiness of place. There are many occasions we sanctify, but very few places we call holy. Is that the whole truth? Not at all, for the very place in which we live, our permanent residence, is sanctified. This is achieved through a very concrete ritual, through the mitzvah of mezuzah. Mezuzah is of biblical origin and therefore carries great weight. “And you shall inscribe them on the doorposts (mezuzot) of our house and on your gates” (Deuteronomy 6:9, 11:20). What is to be inscribed? Divine instruction is very clear: “The words that I shall tell you this day”: that you shall love your God, believe only in Him, keep His commandments, and pass all of this on to your children. Thus, a mezuzah has come to refer also to the parchment, or klaf, on which the verses of the Torah are inscribed (Deuteronomy 6:4-9, 11:13-21). Mezuzah refers as well to the case or container in which the parchment is enclosed. A mezuzah serves two functions: Every time you enter or leave, the mezuzah reminds you that you have a covenant with God; second, the mezuzah serves as a symbol to everyone else that this particular dwelling is constituted as a Jewish household, operating by a special set of rules, rituals, and beliefs. The klaf must be hand-lettered by a kosher scribe — one who is observant of halacha (Jewish law) and who qualifies for the task. The case or container, on the other hand, has not special requirements. It can be purchased or homemade; it can be of any size or shape or material. The scroll is rolled up from left to right so that when it is unrolled the first words appear first. The scroll is inserted into the container but should not be permanently sealed because twice in seven years the parchment should be opened and inspected to see if any of the letters have faded or become damaged. A mezuzah should be fixed to the doorpost of ever living space in the house, not just the entrance door. Any room that has two doorposts and an overhead lintel requires a mezuzah, so one should check with a rabbi. Bathrooms, closets, laundry room, boiler room, and so forth, however, do not require a mezuzah. The mezuzah should be put up as soon as possible after moving in, and not later than thirty days. A temporary residence, that is, a place we reside in for less than thirty days, doesn’t require a mezuzah; nor does an office or place of business. A dormitory room, which a student considers a home away from home, should have a mezuzah. When a family moves it should not remove its mezuzot from the doorpost if its knows that another Jewish family will be moving in subsequently. (If the case is a valuable one, one can substitute another case, but the klaf should remain.) If one knows that a Gentile family is to follow in that place of abode, the mezuzot should be removed, lest they be considered useless and thrown away. In the Land of Israel, the 30-day rule for affixing a mezuzah does not apply. There, one should affix a mezuzah to the door when moving in. The mezuzah is affixed to the right side of the door as one enters a room. In other words, if your door swings open from hallway into bedroom, the mezuzah would be nailed to the right-hand doorpost as your face the bedroom from the hall. This is so no matter whether the doorknob is on the right- or left-hand side. It should be placed at the lower part of the top third of the doorpost, which is generally about eyeball height for a six-foot-tall person. It is affixed at a slant, with the lower part of the container toward you as you face the right doorpost. A mezuzah contains God’s name and therefore great pains are taken to see that it doesn’t fall. The case must be securely attached at top and bottom rather than hanging by a nail from the top of the mezuzah. If the doorpost is too narrow to affix the mezuzah on a slant, it can be attached vertically, but still must be nailed or glued at top and bottom. 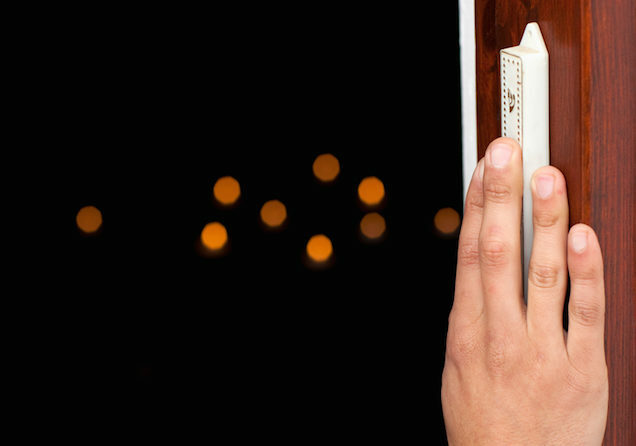 The ritual for affixing a mezuzah is very brief and very simple, especially so considering its enduring nature. Mezuzah in one hand, one recites this blessing. Barukh ata Adonai Eloheinu melekh ha-olam, asher kiddeshanu be-mitzvotav ve-tzivvanu likboa mezuzah. Blessed are You, Lord our God, Ruler of the universe, who has sanctified us with His commandments and commanded us to affix a mezuzah. After reciting the blessing, all those standing about answer “Amen.” Immediately the mezuzah is nailed or glued to the right doorpost. That’s it — a 30-second ritual that lasts the lifetime of tenure in that place…. Is the Mezuzah an Amulet? One final word about the symbolic status of a mezuzah. The parchment is inscribed on only one side. On its reverse side, only one word appears: Shaddai, one of the names used for God. 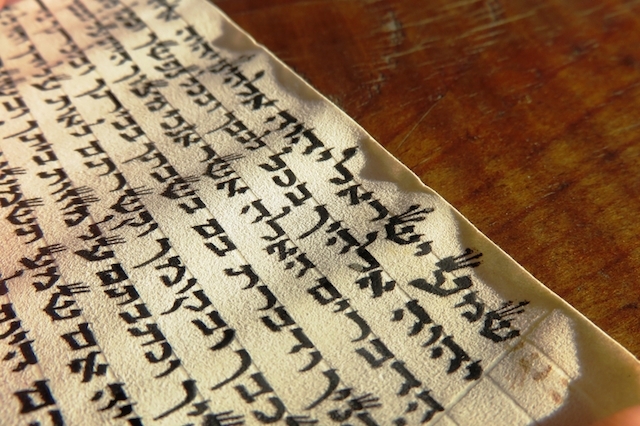 When the scroll is rolled properly, the “Shaddai” is facing the eye. The Hebrew letters of “Shaddai,” shin, dalet, yod are also the initials of the phrase shomer daltot yisrael, the Guardian of the doors of Israel. Partly as a result of this lettering, partly because some people naturally tend toward superstition, the mezuzah sometimes has been accorded the status of amulet, a magical charm. Not only in medieval cultures but even in our day, some would attribute or explain misfortune as linked to the lack of kosher mezuzot. A mezuzah is not meant to be a protective device, nor lack thereof a source of direct punishment. A mezuzah is a sign and reminder of the Covenant, of our love and commitment and our willingness to create a Jewish household. That, in itself, is sufficient! Reprinted with permission from How to Run a Traditional Jewish Household, published by Simon & Schuster.